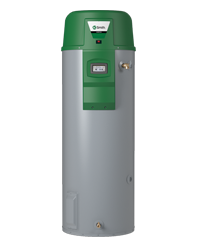 The ProLine® XE Power Vent gas water heater is engineered to maximize efficiency while offering greater flexibility in installation options. Featuring a 50-gallon (nominal) tank and a 50,000 BTU gas burner, the GPVT-50 Power Vent delivers a first hour rating of 90 gallons and a recovery rate of 55.9 gallons per hour. 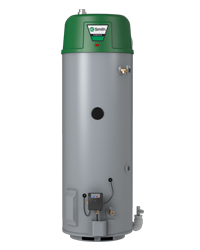 With an 0.72 Uniform Energy Factor, this water heater is ENERGY STAR® qualified. It carries a 6-year limited warranty, and meets Low NOx emission requirements. Is this enough hot water? The estimated annual cost to operate this water heater in Cambridge, MA. Many factors affect the actual performance of a water heater. This represents our closest approximation of your likely experience with this water heater in Cambridge, MA, but actual performance may vary depending on factors beyond our ability to control or estimate. To view or adjust our assumptions of the most common factors that impact this product’s performance in Cambridge, MA, please view the advanced settings. *Annual energy costs are estimated from the energy efficiency of each water heater, your household’s estimated water usage & set temperature, the average groundwater temperature for your location, and residential energy prices as reported by the Department of Energy. Our exclusive 3-position rotatable blower outlet adds flexibility for an easy installation. A. O. Smith’s anode rods have a stainless steel core that extends the life of the anode rod allowing superior tank protection far longer than standard anode rods. Top-mounted T&P relief valve available as an option. Gas water heaters heat water by burning either natural gas or LP (propane). Gas water heaters need a source of air and also need to be vented properly. Cold water enters the water heater through an internal “dip tube” which forces the cold water to the bottom of the tank and pushes hot water out through the outlet connection. This arrangement provides the most hot water for a given tank size. Most gas water heaters use a pilot light. The pilot light on some models also generates the power needed to operate an electronic gas valve. When cold water enters the tank, the temperature sensor on the gas control tells the main gas valve to open. Gas flows to the burner where it is lit by the pilot light. The air needed by the burner is supplied by the room where the water heater is installed. The exhaust gases are vented to the outside. When the proper temperature is reached, the main gas valve shuts off. Because water can corrode the steel tank, we glass line the inside of the tank and install an anode rod to help reduce corrosion. The temperature and pressure relief valve is a safety device designed to open if the internal temperature or pressure of the tank exceeds certain limits. 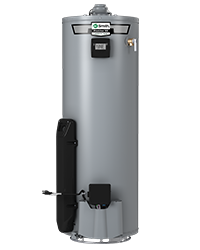 Water heaters should be large enough to provide adequate hot water even when temperatures are cold and household demand is greatest. Height w/Draft Hood: 68 1/2"
Rebate and incentive programs provide cash-back to consumers for the purchase of appliances that meet certain energy efficiency standards. Often, these standards are tied to the ENERGY STAR® program. Cash for Appliances is designed to encourage the purchase of energy efficient appliances. Consumers who purchase ENERGY STAR® or CEE qualified appliances can receive cash rebates. Most states are offering rebates in the $50 to $250 range. Please click here to download the hi-resolution images.